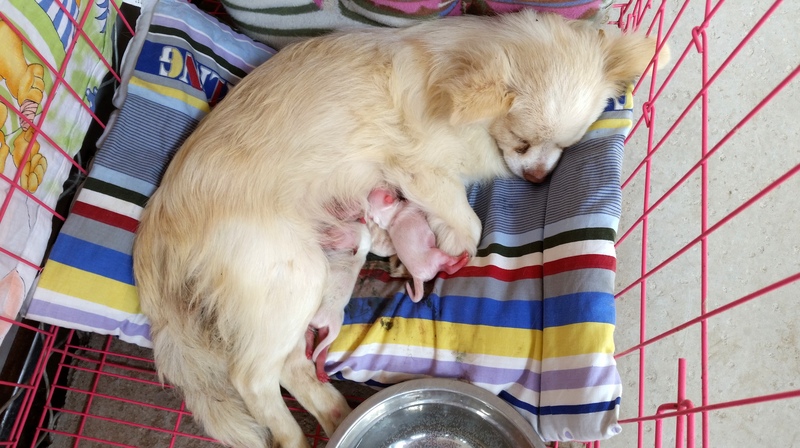 Does grieving mum Angel, suffering from distemper, have the strength to survive? Heavily pregnant she was stuffed into a cage and loaded onto a lorry. After being driven for hundreds of miles in extreme heat with no access to food or water she and her unborn pups would have been put to death in the cruelest way. Miraculously she was rescued but her ordeal is not yet over. Angel is in hospital right now but the treatment is expensive. NoToDogMeat plans to bring Angel and other truck rescue dogs like her to a forever home the UK once they are fit enough to make the long journey from China. They have gone through so much – please help us make it all not in vain. We cheer when we hear that a truck laden with dogs has been successfully stopped by activists. These people do their utmost to ensure that the dogs do not go to the meat market. However, before the dogs can be released and taken to various places of safety the rescuers have to plead and negotiate with the police, the driver of the truck and the ‘owner’ of the caged animals. Unfortunately these negotiations can take days during which dogs remain stuffed like sardines in the cages on the truck, in the searing heat, defecating and urinating on top of one and other and spreading deadly bacteria. Some of these dogs are pregnant, many of them have broken tails, paws and other terrible injuries and are in desperate need of veterinary care. If they are successful the rescuers can begin to unload the dogs – a job which presents more problems and requires great care. As the dogs are terrified and in pain they can bite anyone who comes close and any of these dogs could be carrying tetanus, or worse, rabies. It is a testament to the activists’ bravery that they persevere with this task. Afterwards the dogs are taken to various places of safety where they are carefully examined and given vaccinations for rabies and other diseases. The most troublesome problem for the rescue centres is the disease distemper which is endemic in the meat trade. Canine distemper is a virus that affects a dog’s respiratory, gastrointestinal, and central nervous systems, as well as the conjunctival membranes of the eye. The first signs distemper include sneezing, coughing and thick mucus coming from the eyes and nose and dogs develop fever, lethargy, sudden vomiting and diarrhea, depression and/or loss of appetite. Distemper is passed from dog to dog through direct contact with fresh urine, blood, mucus or saliva. Sneezing, coughing and sharing food and water bowls are all possible ways for the virus to be passed on. The virus spreads rapidly and must be aggressively treated as soon as it’s discovered. Puppies and adolescent dogs who have not been vaccinated are most vulnerable to the distemper virus. Veterinarians can offer intravenous fluids to prevent dehydration and antibiotics to ward off secondary infections while the infected dog builds up his/her immune response. Some dogs are able to survive the infection, while for many others canine distemper is fatal. When we recently visited China ( August 2015) we witnessed an outbreak of distemper in one of the shelters. Dogs were coughing, sneezing and were lethargic and some too ill to move. It was an awful condition to witness. Near Beijing at the shelter of Mr Zhao Xinqi, who has been rescuing dogs from the trucks for some 20 years we met two small female dogs. Both of them had given birth to a litter a couple of days after they were taken from a truck driving them to the butchers at the meat markets. Angel and Tamsin’s pups were born premature due to the trauma of their experience on the truck. Both Angel and Tamsin looked very distressed and I was told that one of Angel’s pups had died that morning. Angel was not taking any notice of her remaining pup which was lying by itself for a long time. I stroked Angel and carefully checked if she had any milk. Her tiny malnourished body was unable to produce milk after the trauma she had been through. With her immune system weakened she caught distemper and her pups died within days She looked so depressed knowing that she could not take care of her remaining baby and it was evident that she was distancing herself from her dying pup. Without finding another female he had no chance. I held her little boy who felt cold and lifeless in my hand and he immediately started to suckle my finger. I checked with Tamsin, the other female, she was weaning her two puppies. She was producing enough milk and I put the little boy with her who she lovingly accepted as one of her own. We told Mr Zhao Xinqi that we would like to adopt both females as soon as the pups were old enough to be re-homed. Knowing that the little pup was being taken care of we left the shelter relieved but with a heavy heart – many of the dogs from the previous rescue had arrived suffering with distemper. Since our return to the UK Mr Zhao Xinqi has been communicating with us via Wechat on a daily basis. Unfortunately, Mr Zhao Xinqi has informed me that both Tamsin and Angel had contracted distemper. The next message that came through was that all puppies had caught distemper and had died. Both mothers were very ill. At our request both mothers were taken to hospital where their long treatment could begin. The veterinary surgeon said that their chances of survival was only 20-30%. The struggle for survival continued and reports from China were not good. Especially Angel was suffering very badly. I am happy to know that both dogs are in hospital that that they are under medical care and supervision of a dedicated veterinary team but there is no guarantee of a happy ending. Every day Mr Zhao Xinqi keeps us informed about the condition and progress of the dogs. Partial good news came a week later when Mr Zhao Xinqi informed us that Tamsin was recovering but that little Angel was still very ill.
Tamsin, sitting up for the first time, on her road to recovery. 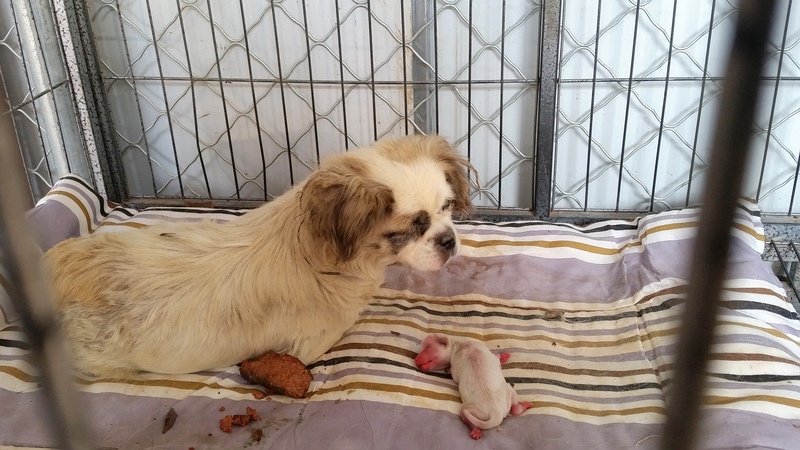 Will grieving mum Angel have the strength to survive distemper? I can only send her love and healing and hope that she does not leave earth without somehow knowing that humans can love dogs and as much as they love us. Little Angel, desperately ill fighting for her life.